Israel often gets slammed by the media, so when there is positive coverage of Israel in the news, it is important to showcase it. Several major media outlets have lauded Israel for its quick and efficient aid in Haiti following the devastating earthquake there. Rabbi Tzvi Hersh Weinreb of the Orthodox Union writes for the JTA: "The Jewish community, in its entirety, can be proud of its response thus far to the Haitian catastrophe. Rescue teams from the State of Israel and millions of dollars from the Jews of America are but examples of our response. Whatever the motivation for these responses, this has been a religious response, a Jewish response." He explains earlier in his op-ed that the Jewish way of responding to natural disasters is to: "See. Feel. Act." Yesterday, I was pleasantly surprised to see how CNN was singing the praises of Israel's response in Haiti. 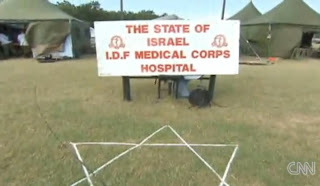 Even though the Israelis came from the other side of the world, the report notes that the Israeli army was the first to set up a field hospital in Haiti. One woman explains, "I've been here since Thursday and no one except the Israeli hospital has taken our patients." When the reporter walks into the Israeli field hospital she says that it's like another world because of the imaging technology and the operating rooms the Israelis have set up. Diane Sawyer also featured the quick response by the Israelis in Haiti on ABC News. Sawyer speaks with a correspondent who helped deliver a baby and then watched as another baby was delivered in the Israel Defense Forces field hospital. The baby was named "Israel." In addition to the response by the Israelis on the ground in Haiti, other articles have praised the American Jewish community for the outpouring of aid through charitable gifts and medical supplies. The JTA reports: "By Tuesday, AJWS raised $1.8 million from more than 16,000 people via its Web site. The JUF-Jewish Federation of Metropolitan Chicago raised $283,000 in five days from 2,200 donors. Almost all of it -- nearly $260,000 – came in online, from 2,058 individuals. UJA-Federation of Greater Toronto raised $173,240 so far, much of it online. Those involved in the fund-raising effort say the Jewish community’s gifts to the people of Haiti stem from Jewish values." The New York Times today also featured an article praising Israel, but this time it had to do with the Winter Olympics. The article explained that Israel is hardly a winter sports powerhouse (no surprise! ), but this year may prove differently for Israel in the Winter Olympics in downhill skiing and ice-skating. I can only hope that this positive coverage of Israel by the media continues. At least the world is taking notice of Israel's rapid response to the need for humanitarian aid in Haiti. CBS News calling the Israeli Field Hospital - "the Rolls Royce of emergency medical care"